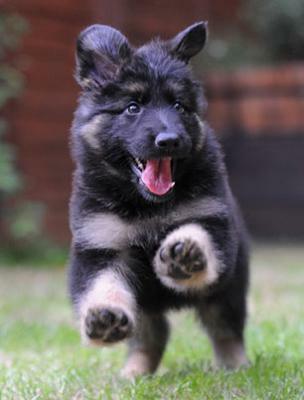 It is your responsibility to potty train your German shepherd puppy - not your parents if it is your GSD, so if you want to keep it and make your parents accept it you will have to teach it to use the bathroom in an appropriate area. So you'll have to make a decision - just how much do you want the puppy? And just how much are you willing to sacrifice time-wise to train the puppy yourself - or are you willing to lose the puppy all together because you do not want to take on the responsibility? It's really not that hard to do and generally doesn't take that long time-wise IF you really decide to follow through and do all that is necessary to train the puppy. Remember, you didn't come potty trained either. Your 2 month old German shepherd puppy is just a baby. It has no problem "going" when it needs to. But it is your job as an owner to teach the puppy when and where to go. Otherwise it will continue to "go" when it has to "go". And it will be your fault when it goes in the wrong place because you didn't teach it any better way to do it. The actual process of teaching a puppy potty training usually only lasts a few weeks for most German Shepherds (or less) at the most because they are so smart - but this one very important lesson can last a lifetime. So you must make up your mind now - do you want to clean up poo and pee for the rest of your life because you did not take a few weeks out of your schedule to train your dog - OR, are you going to take the time to potty train the puppy now? It's up to you. And if you need help on how to do it, there are loads of books on the subject, many TV shows that address the proper way to do it and several sources online that can share info on what you need to do to potty train a puppy. I'll list one potty training course below for you to check out too. Good luck!